If you were planning on ushering in the first beautiful day of spring by blasting “Big Pimpin’” while driving your children to Sunday school this morning, you already know the bad news: The majority of Jay Z’s catalog is not longer available on Spotify. 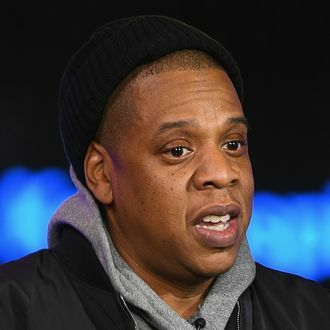 Billboard reports that his songs were pulled from the streaming platform Friday, April 7, “at the request of the artist.” All that remains of Hova’s oeuvre on Spotify is little more than a handful of hit singles, including “Dirt Off Your Shoulder,” “N—s in Paris,” and Linkin Park’s “Numb/Encore,” as well as Jay Z’s two collaborative albums with R.Kelly, 2002’s The Best of Both Worlds and 2004’s Unfinished Business. Unless “Numb/Encore — A Cappella Explicit” and Jay’s feature on Lenny Kravitz’s 2004’s “Storm” is enough to satisfy your needs, fans will have to turn to Jay Z’s own platform Tidal or, as of now, Apple Music. If not, well, “Numb/Encore — A Cappella Amended” will be waiting for you to enjoy.